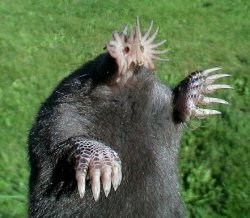 Star nosed Moles are the only member in the Condylurini tribe and the Condyluraone genus. These moles are among the most interesting creatures in existence with some unique qualities and abilities. These virtually blind mammals have earned their name from their star- shaped nose which works as a sensory organ. Find out here the description of this amazing species. Color: The Star Nosed Moles have a blackish brown appearance. Size: They can grow between 15 and 20 cm in length. 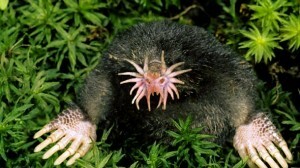 Weight: The average weight of an adult Star Nosed Mole is 55 gm. Body: Their body is covered in black-brown water-repellant fur. They have a long tail. Legs: These moles have four large legs covered in scales. Head: They have a pair of beady eyes that are not developed enough to see making these mammals nearly blind. They also have 44 teeth. Nose: The most unique feature in the appearance of these mammals is their nose which is larger than other mole species. They have 11 pairs of fleshy pink tentacles at the end of their snout that make the nose look like a star. The main distribution range of these animals extends to the north-eastern US and eastern Canada. They are found in places like Labrador, Quebec, Minnesota, Indiana and South Dakota. These mammals can also be found along the Atlantic Coast and in the Appalachian Mountain area. The Atlantic Coast range extends to south-eastern Georgia. They are semi-aquatic animals preferring low wet areas. The tunnels of these moles often lead below water surface. They can be found in wet meadows, marshes, banks of streams, lakes and ponds. These small mammals feed on various small insects and fishes including ants, worms, beetles, mollusks and snails. These creatures like wet areas, but sometimes they are found in terrestrial lands away from water. Star Nosed Moles can swim. They are able to smell and hunt underwater. They spend more time on terrestrial lands than other species of moles. These animals are active both during day and night. They remain equally active during winter, when they make tunnels in the snow and swim in partly frozen streams. Their tails function as fat storage for the breeding season in spring. Sometimes, the members of this species create and live in colonies. The nose is the principal sensory organ of the Star Nosed Moles as they cannot see. The tentacles covering the edges of the nose contain 25,000 highly sensitive touch receptors (Eimer’s Organs). German zoologist Theodor Eimer was the first person to observe these receptors in the European moles. 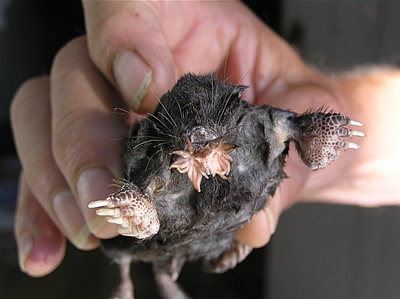 Other species of moles also have the Eimer’s Organs, but in fewer numbers. These completely hairless tentacles help them in hunting. They identify insects, invertebrates or any other consumable substance around them by the help of these tentacles. They hunt by touching their prey. It takes them very little time to decide if a substance is edible. The whole hunting process takes an average 230 ms (millisecond- a thousandth of a second) to complete once they find their prey. The breeding season starts in mid-March and continues through April. They are known to reproduce once every year, but the females may reproduce a second time if their first litter is unsuccessful. One litter may contain 2- 7 offspring. These mammals are born with closed eyes, ears and folded tentacles. These organs become functional after two weeks. The young creatures become independent 30 days after their birth. It takes 10 months for a young mole to reach full maturity. The exact lifespan of the members of this species is unknown. But they live approximately 3-4 years in the wild. Many raptors, mammals and reptiles including hawk, owls, skunks, weasels, minks and snakes prey on these moles. The touch receptors or Eimer’s Organs on their tentacles help them to locate and identify a prey. These tentacles help them to examine 13 different spots around them in one second. Each tentacle is six times more sensitive than a human hand. Their black-brown fur is water repellent, keeping their body warm during the winter. They are given the ‘Least Concern’ status by the International Union for Conservation of Nature and Natural Resources (IUCN). It means that there are no immediate threats to their existence. Formerly, there was some confusion over the naming of these animals. Questions were raised about whether the star- shaped sensory organ should be called an “eye” instead of a “nose”, because they help these animals to “see” their way around. But the fact that they already have two beady eyes prevented its being called so. In the Guinness Book of World Records, they are mentioned as the world’s fastest foragers. In fact, they forage and consume their prey at a speed that is too fast to be followed by human eye. Each tentacle of these mammals is six times more sensitive than a human hand. Their black-brown fur is water repellent keeping their body warm during the winter months. It keeps them from freezing when swimming in cold water during winter. They are the only living members of their genus Condylura, tribe Condylurin and subfamily Scalopinae. A baby Star Nosed Mole is called a ‘Pup’. A group of these animals is called a ‘Company’, ‘Labor’ or ‘Movement’. Some scientific research suggests that these creatures might be able to sense the electrical impulse from their prey with the help of their tentacles. Their brain functions at almost the highest speed a nervous system is capable of functioning. During under-water foraging, they exhale small air bubbles and inhales them back within a few moments to smell the scent trail of prey or food. These moles are one of the strangest looking creatures in the world. But in some ways, they are more capable than even a human. They may look ugly to some people, but they are undoubtedly one of the most interesting creatures in the world. Yall need to get some physological facts about this mole on here.